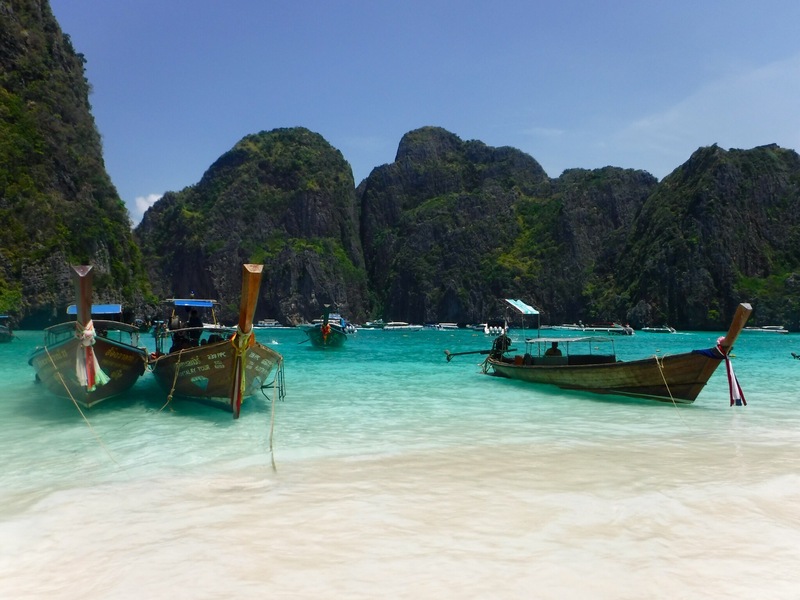 Koh Phi Phi has probably been the most westernised island we’ve been to which has had its pros and cons. 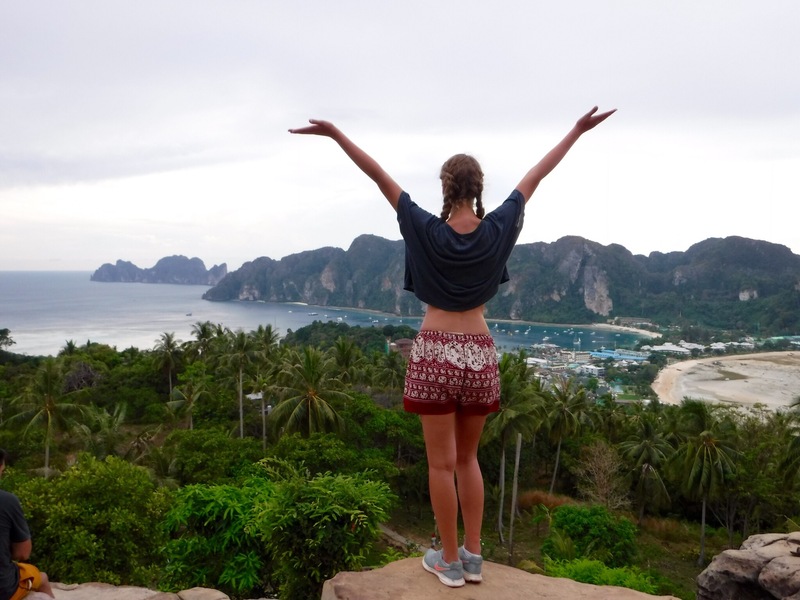 We had to get 2 boats and two busses to get here from Koh Tao and once we were walking to our hostel I couldn’t help but think of how different it is to Vietnam where we were only a few weeks ago. 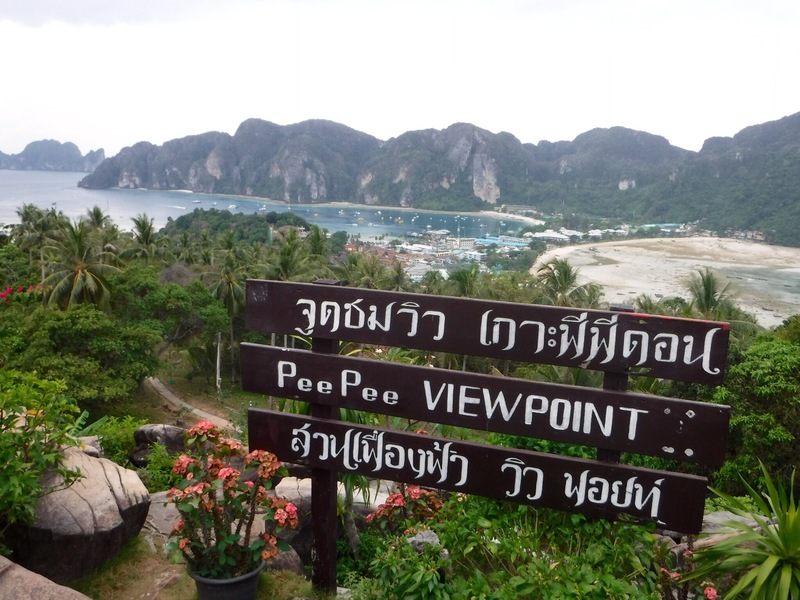 In Vietnam we had to constantly be aware of motorbikes everywhere but on Koh Phi Phi, vehicles aren’t allowed. I saw the odd motorbike and one ambulance (basically a golf buggy with a bed in it) and that was it! 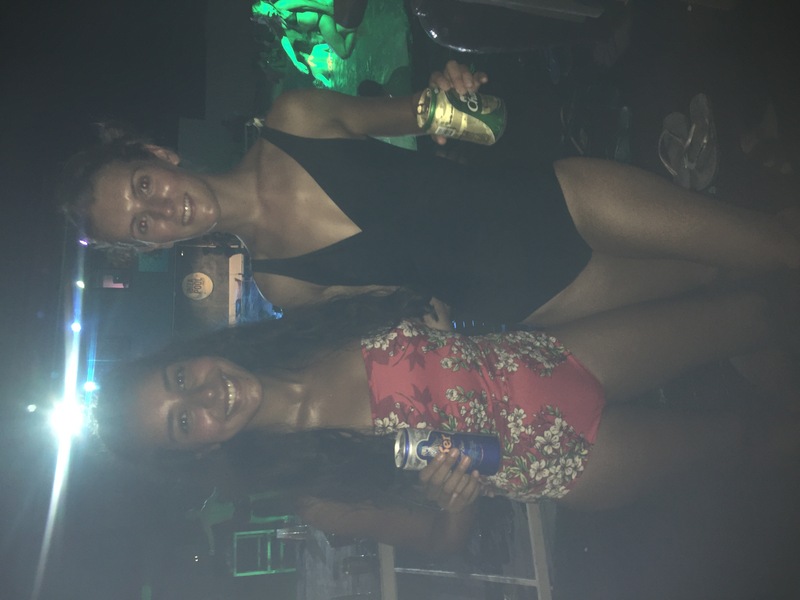 After a lot of kerfuffle with the staff, we checked into Ibiza House Hostel and got straight into swimwear for a pool party. Our boat had arrived a lot later than we initially thought so by the time we got to the pool everyone was already very drunk. Water was being splashed everywhere, guys were jumping in and people were busting some shapes at one end of the pool. We had a couple of beers and then Ammun and I went in for a bit. However we didn’t want to get our hair wet and Tom was very sunburnt so none of us were massive party animals! This photo does not portray our actual skin colour or how naturally shiney we are! We all enjoyed our food except poor Tom who’s meal had got mixed up with someone else’s and he had a pile of crushed nuts on the side that could kill him. We all watched him eat around it, feeling very nervous but it was all fine! 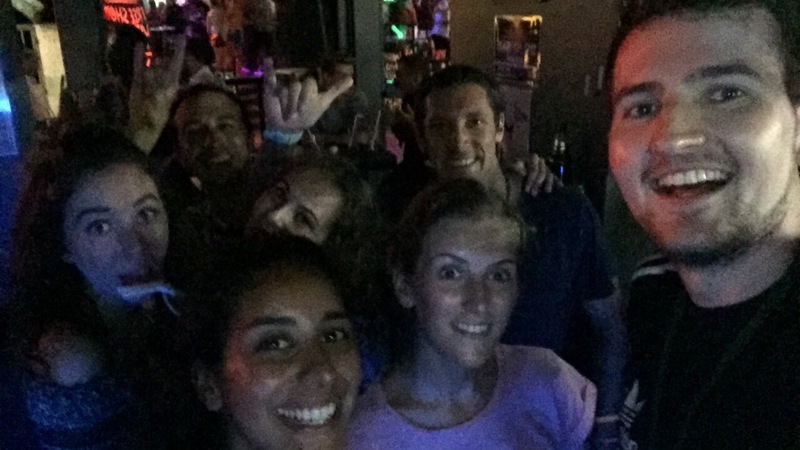 After dinner, Alexis (Argentina), Mateo (Uruguay), Rafa (Brazil), Chelsea and Izzy (England) and Ammun, Tom and I all stayed out together and went for drinks and a dance in a bar called Dojo. The music was incredible as most of it was 90s R&B, including some songs that we love but are never ever played normally. 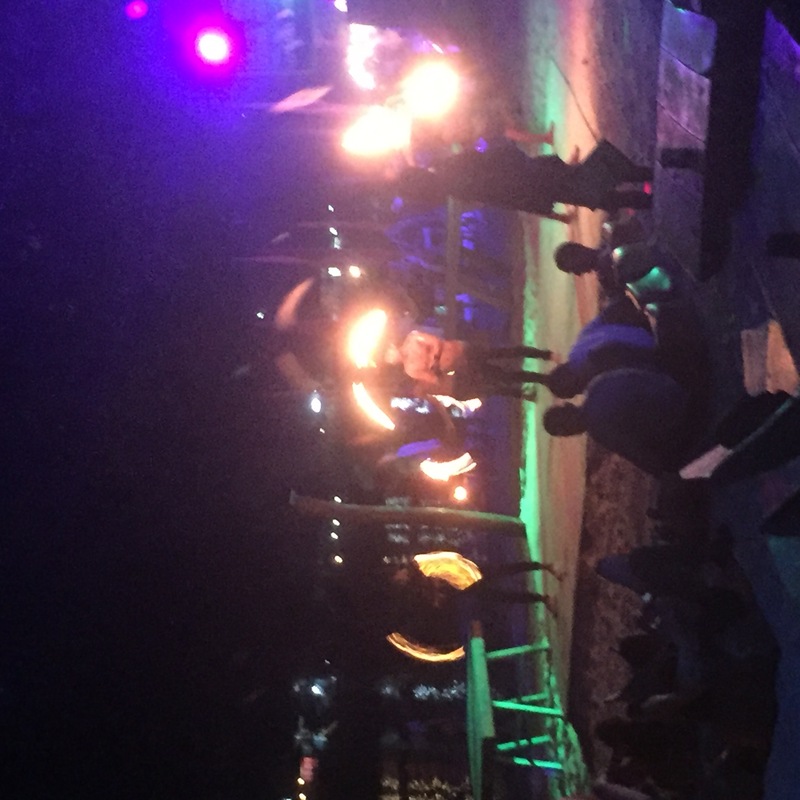 Afterwards, we all headed to a bar on the beach called Sling Bar where there was loud music, people dancing and a few guys playing with fire! It was so mesmerising to watch! We didn’t stay long as we all got hungry for pizza and chicken nuggets (not seagull nuggets like one guy tried to convince me they were) and we all conked out for the night. After a beautiful lie in it was time to move on. We had booked Ibiza House Hostel last minute and it was quite expensive so we moved to a cheaper hostel, Paradise Dorms. It was the cheapest on the island but still £7 a night! The beds were okay and there were 4 bathrooms but the first dorm (the one we were in) was also a corridor into another dorm, it stank of urinals, I spotted cockroaches in the bathroom and I generally just felt sad being there. On the plus side, it was only 2 nights and the location was awesome between all the bars. After an amazing brunch with eggs we hiked up to viewpoints 1 and 2 passing many out of breath Chinese tourists on the stairs up. It was quite an overcast day so the views weren’t as spectacular as they could be but it meant that it wasn’t very crowded at the top and we could get some good pictures. One thing that is made very clear at this point is the devastation that was caused by the 2004 Boxing Day Tsunami. 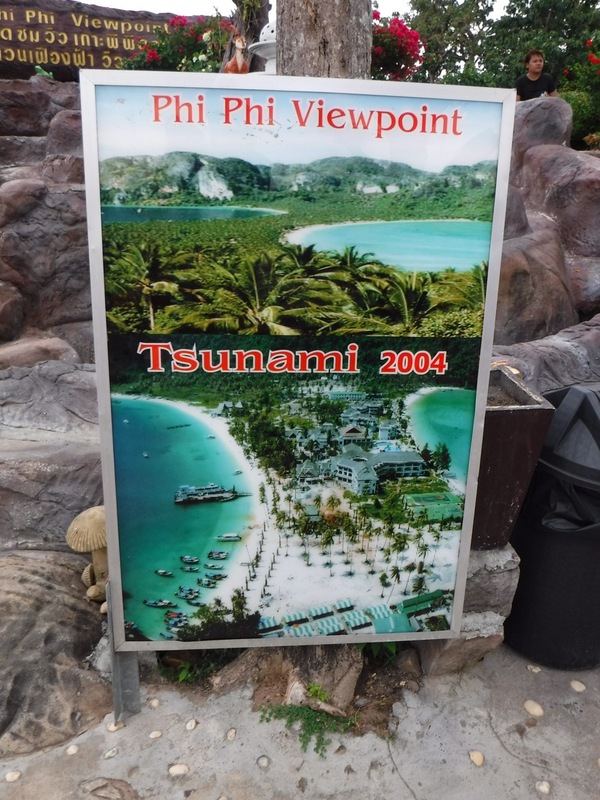 There are photos from before and after from the viewpoint and occasionally around the island you can see tsunami escape routes that take you high above sea level. For dinner we went to Chao Koh restaurant on the beach which served amazing seafood. For starter, Tom bought us all some fried shrimp things and spring rolls. Both came with sweet chilli sauce and both were amazing! For main we all got a dish each and shared around with a big vat of rice which would probably feed a small Thai village. We ate beef in oyster sauce, crab with baby corn in a sauce and shrimp in pepper and garlic. We didn’t finish it all because we were stuffed but it was so so good! Would highly recommend! 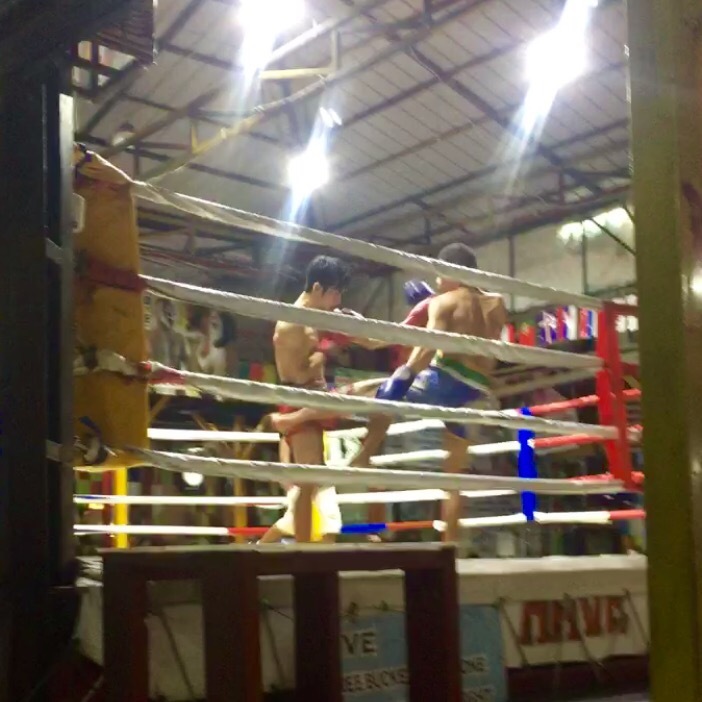 Afterwards we went for drinks at reggae bar where we watched Muay Thai boxing for the first time. 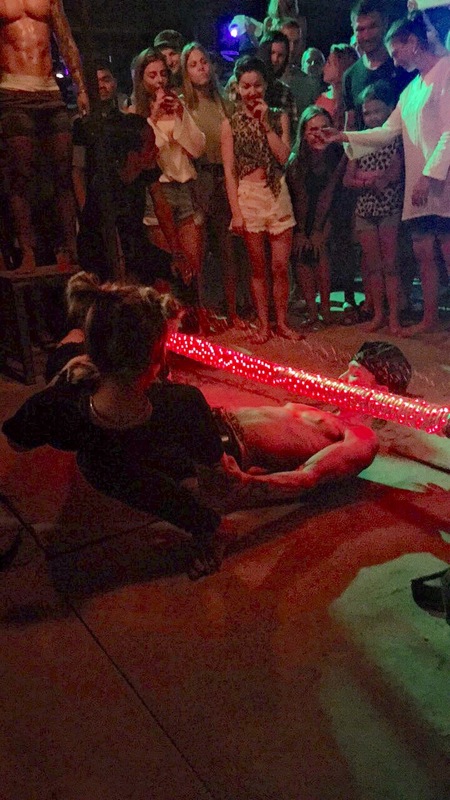 The first match we saw was an amateur one (you get a free bucket of alcohol for taking part so lots of people want a go) where one guy was getting absolutely trashed. We were watching from the bar then just as we sat down he got punched square in the face and fell to the floor. The second match we saw was two professionals giving us a show performance. It was obvious that they weren’t really fighting each other but it was cool to see all their pre fight rituals and the variety of moves that can be done in a match. Luckily, we could still connect to the hostel wifi even from that distance so we could look up the rules! We watched three more amateur fights including a pair of girls (neither of which knew how to fight) and had a great time cheering everyone on! After watching so much testosterone we decided it was time for a snack. And not just any snack, fried ice cream rolls!! I remember seeing a video on Facebook a few years ago and I didn’t really know what it was but I knew I wanted it! 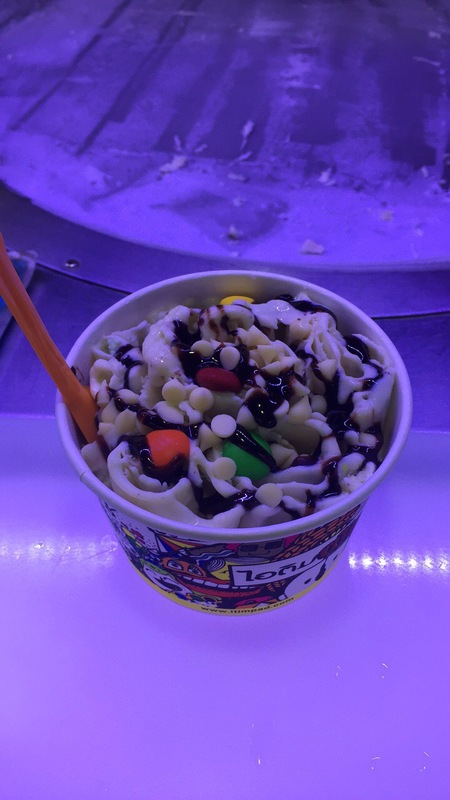 I had vanilla flavoured ice cream with white chocolate chips and m&ms with chocolate sauce on top and it was delightful! It tasted so good but I’m one of those people who mushes up their ice cream before eating it so the texture was a bit strange to me. 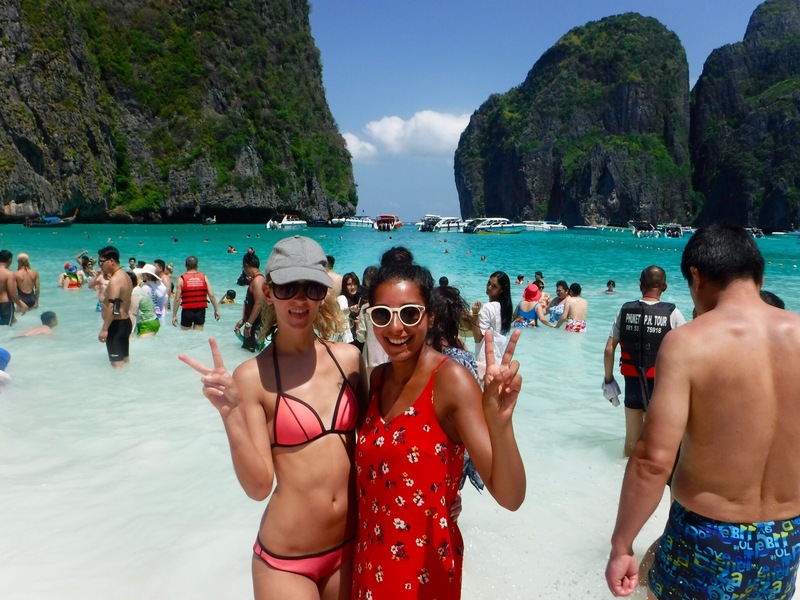 The next day we all got up bright and early for a half day boat tour of Koh Phi Phi and Phi Phi Leh (the smaller island next to the one we were staying on). By coincidence, the South American guys from our first hostel were on this tour too so it was nice to have someone else we knew on the boat. 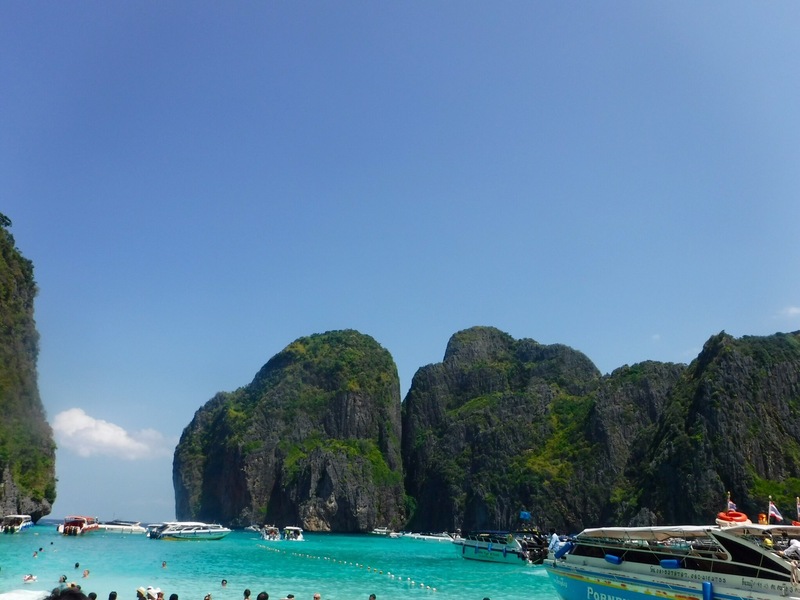 Our first stop was the highlight of the island; Maya bay! This is the main setting for the film The Beach and it is beautiful. 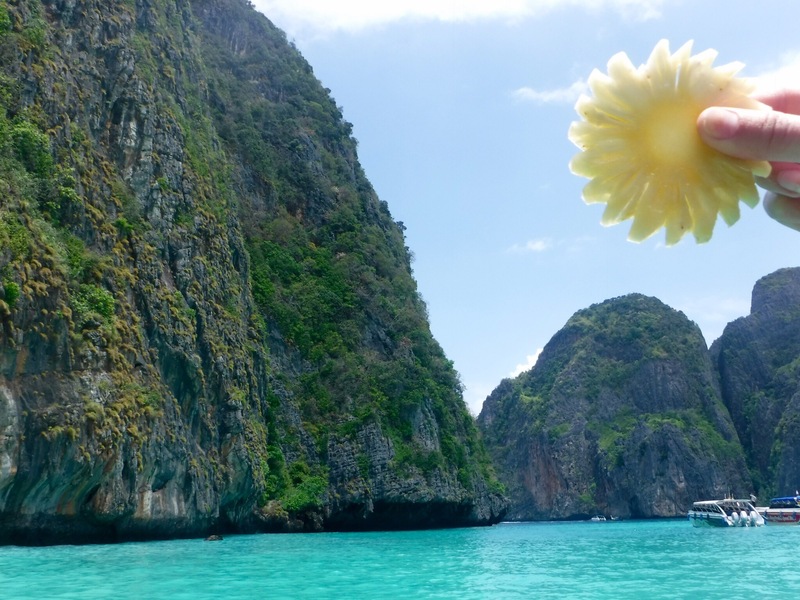 However, if you come here expecting to see what you can see in the film I’m afraid you’ll be disappointed as they have used special effects to make the bay more enclosed and there is approximately 10% of the Chinese population on this beach with their selfie sticks. 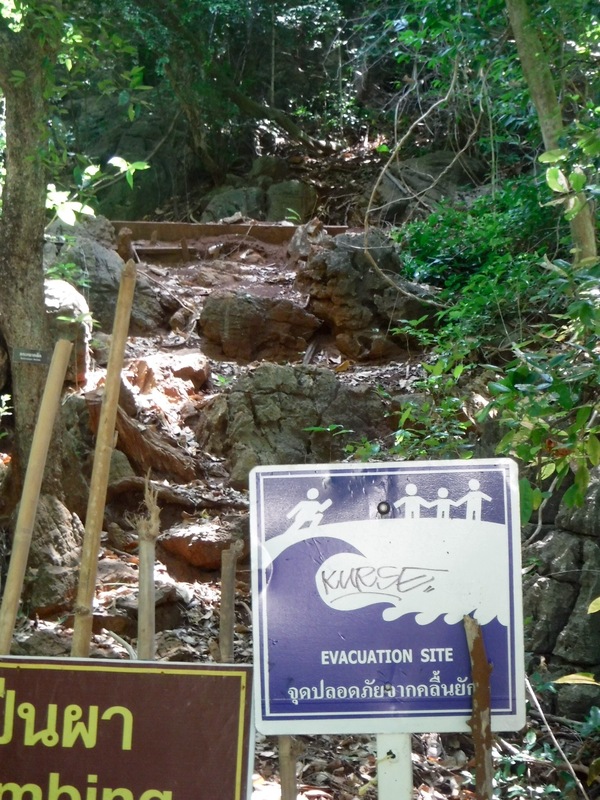 You also have to pay an extra 400 baht (£10) if you want to get off the boat as it is a national park. So expensive for what it is but while you’re there it’s silly to miss out. It was still stunning and I couldn’t believe the colour of the water. 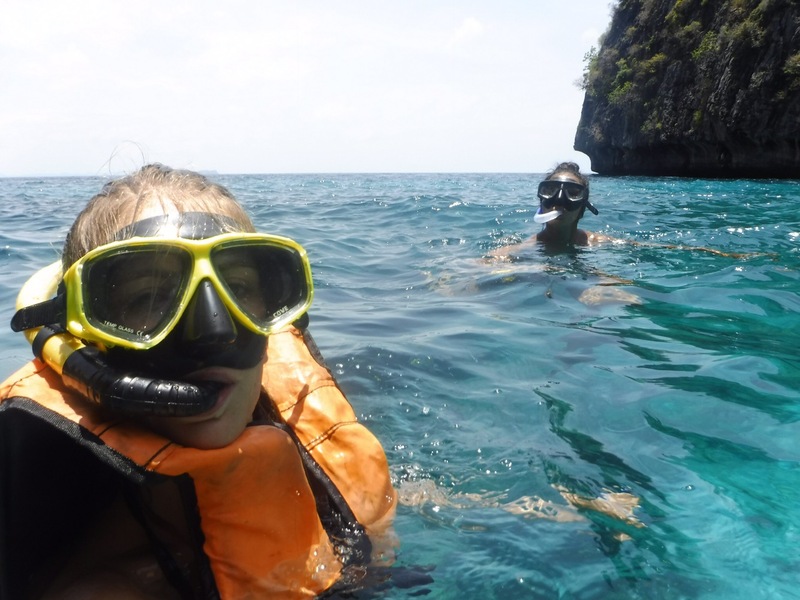 Our next stop was in Loh Samah Bay where we had he chance to snorkel. 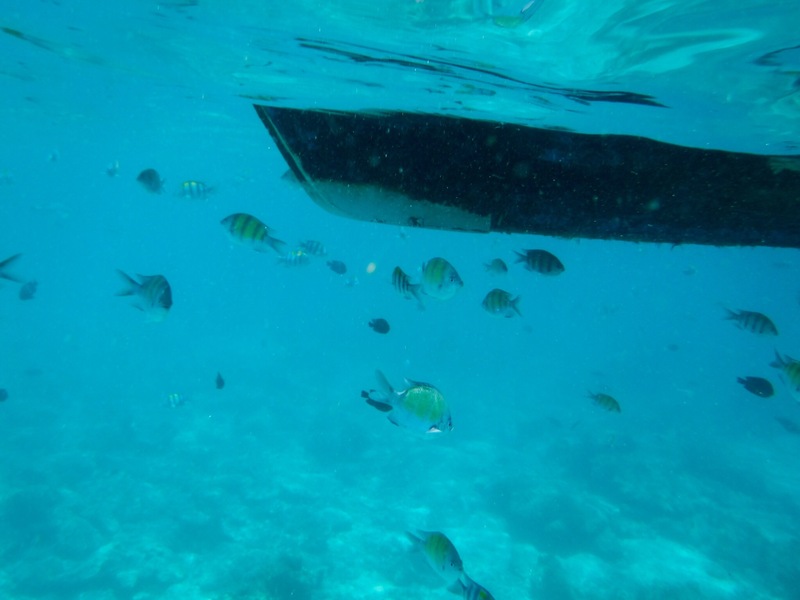 There was a lot of coral and loads of fish so I was very excited. The boat driver even through rice into the water to make the fish come to us (which is really, really bad for the fish but gets some cool photos!) I don’t think I’ve ever properly snorkelled before except messing around in a swimming pool and it was a lot harder than I thought after scuba diving a few days before. I felt like I couldn’t breath properly and the water was so uneasy that I had to climb back on the boat, calm myself down and put a life jacket on before getting back in the water. 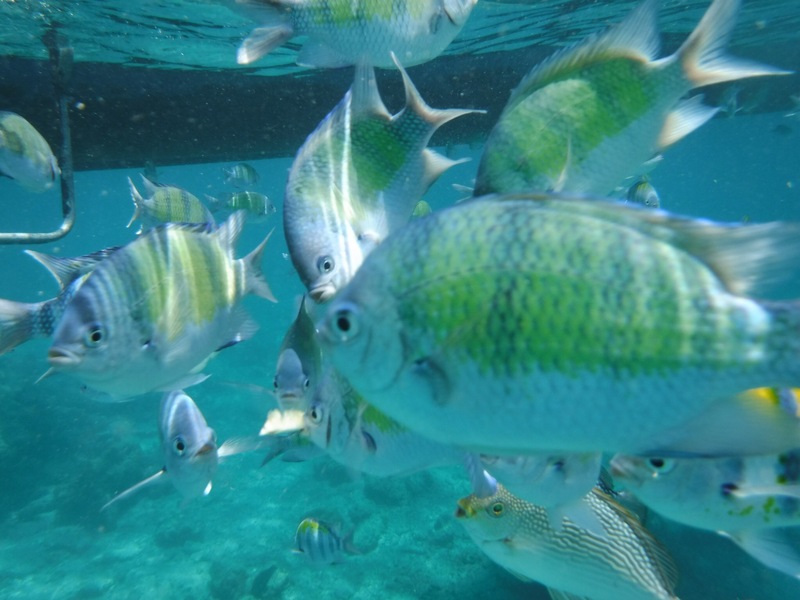 Once I could float and I didn’t have to think about swimming, I had a great time and was so happy to see so many fishes! The next place we went to was Pe-Leh Bay where we were encouraged to jump off the boat and swim. I’ve had a couple of opportunities to jump off a boat in the last few months but it’s always been cold. Finally I had my opportunity and went for it! On the northeastern tip of the island, Viking Cave is a major collection point for outrageously valuable swifts’ nests, the key components of Chinese speciality bird’s-nest soup. Nimble collectors scamper up fragile bamboo scaffolding to the roof of the cave to gather the nests. Before ascending, they pray and make offerings of tobacco, incense and liquor. The cave gets its misleading moniker from the 400-year-old boat graffiti created by crews of passing Chinese fishing junks. So nothing to do with Vikings?? 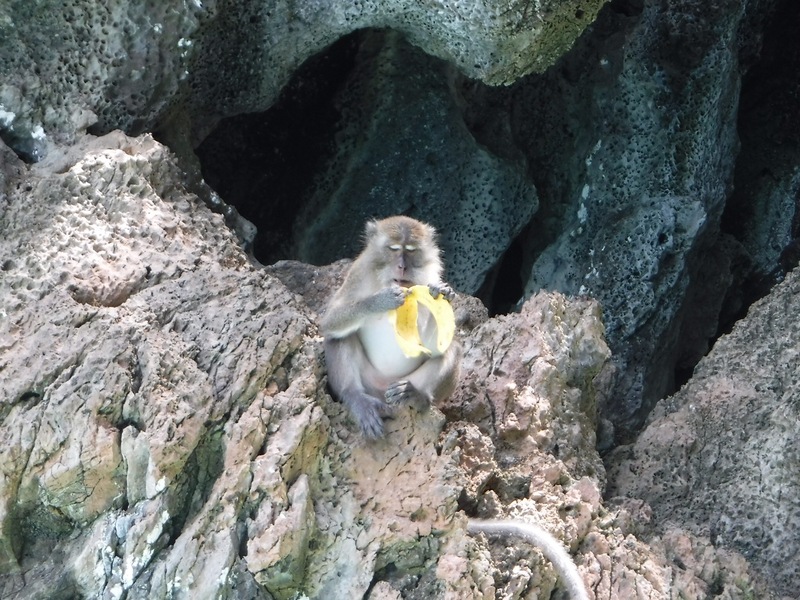 Our final stop (and most exciting in my opinion) was monkey beach. 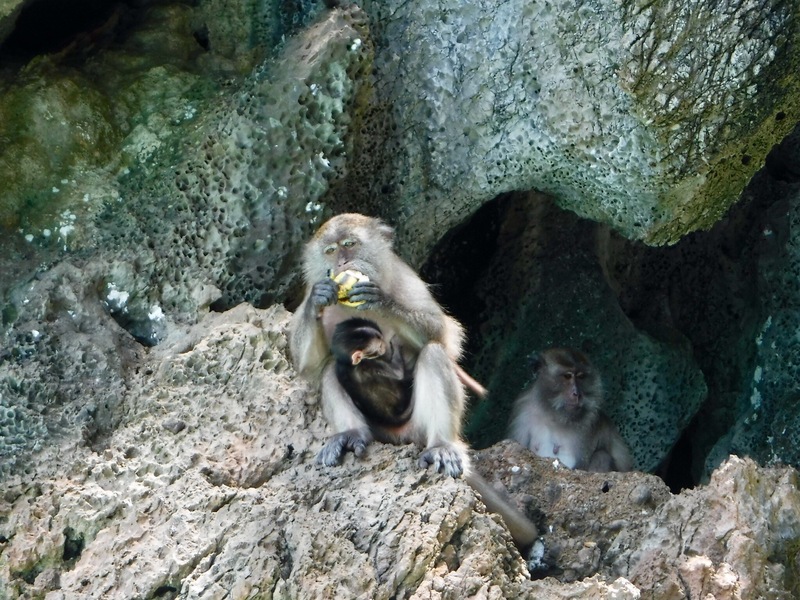 As you’ve probably guessed, it is just a beach with lots and lots of monkeys. Again, there were signs up saying do not feed the monkeys but tour guides were arriving with bags of cut up banana that they would throw at the monkeys. One person even threw a bottle with a little bit of Coca Cola in it. They missed don’t worry. Although, yes, it did give us the opportunity to get some great photos of them, I didn’t really like it because the monkeys become dependant on getting food from tourists so don’t go out and get their own food. This then means they can get aggressive when a person doesn’t have food which I witnessed from one monkey. 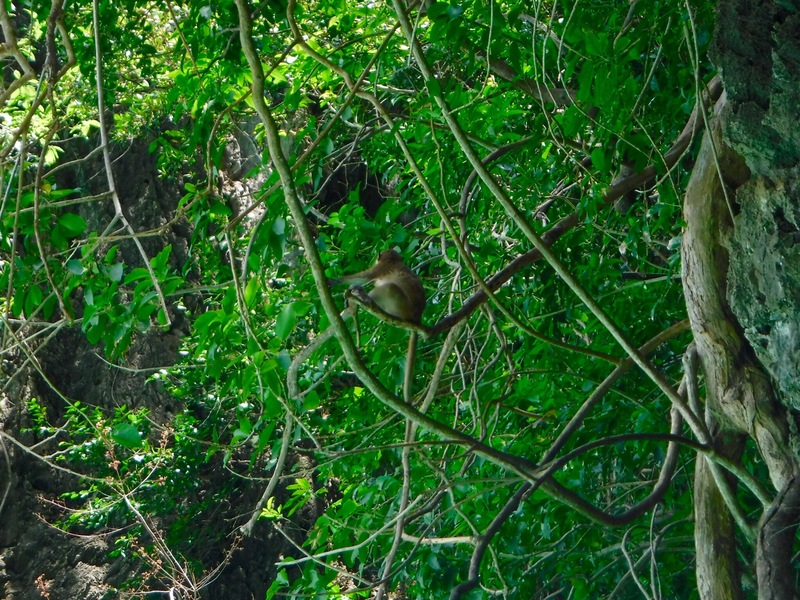 We still enjoyed it and it was cool to see monkeys so close – even one mummy and baby! As we got off and watched the afternoon group get on the boat, we saw the dark clouds roll in and within 10 minutes, the rain was hammering down. 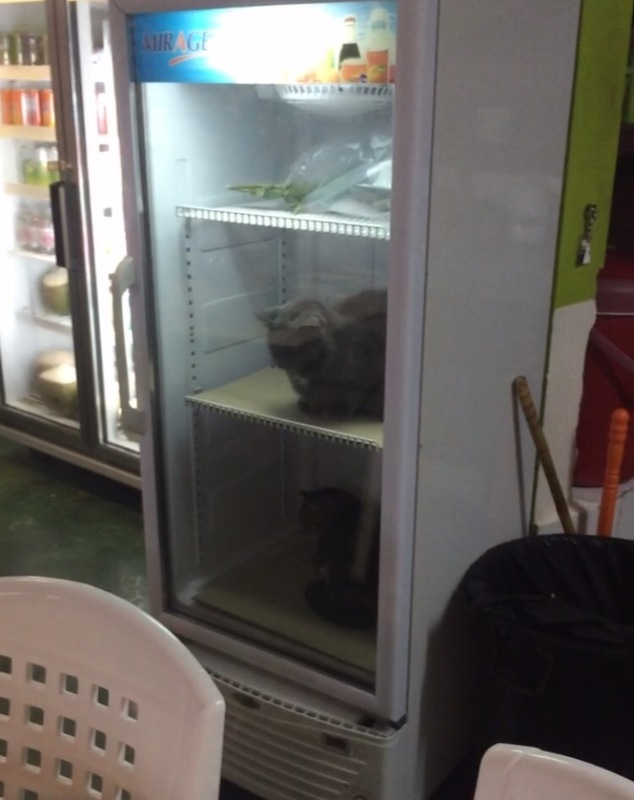 We took shelter in a restaurant and stopped for lunch. Somehow we were absolutely knackered from our boat trip so we slept all afternoon! When we woke up we were ready to party and got on it straight away, ordering a bucket to share at dinner. We ate at Basil and Bistro which was delicious! Ammun and Tom both said that it was the best meal they’d had in the whole of Thailand! 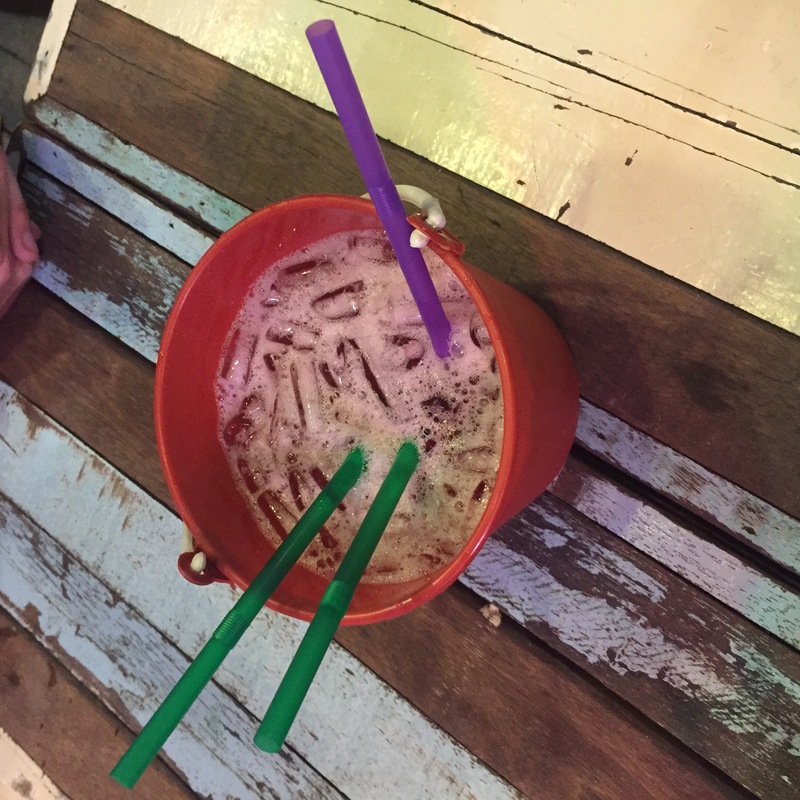 After dinner we went to a bar called Stockholm Syndrome where Ammun and I shared a bucket and Tom had his own that was so strong we had to go and get more mixer in it! The music was okay but we couldn’t help but remember the good music in Dojo a few nights ago so we walked the long 3 metre walk there and were disappointed to find it was a different DJ. After listening to Ed Sheeran Shape Of You a dozen times in between average songs, we thought it was time to head to the beach, picking up another 2 buckets to share on the way. At the beach we bumped into the same South American guys by chance once again and partied the night away with them. Ammun and Tom left earlier than me so the conversation switched from English to Spanish and I was very happy to use my Spanish for the first time since South America in February! We stayed out til the music was turned off and then went to 7/11 for toasties and people watched as we ate them. I think I eventually got to bed about 4am. The next morning, I was feeling a lot fresher than I thought I would and as I was waiting for Ammun and Tom to get ready, I sat outside in the fresh air and watched everyone go by. Including the same guys once again. I don’t understand how on an island filled with so many people, we manage to bump into the same small group of guys a couple of times a day! It would be only fitting to still see them on our last morning! 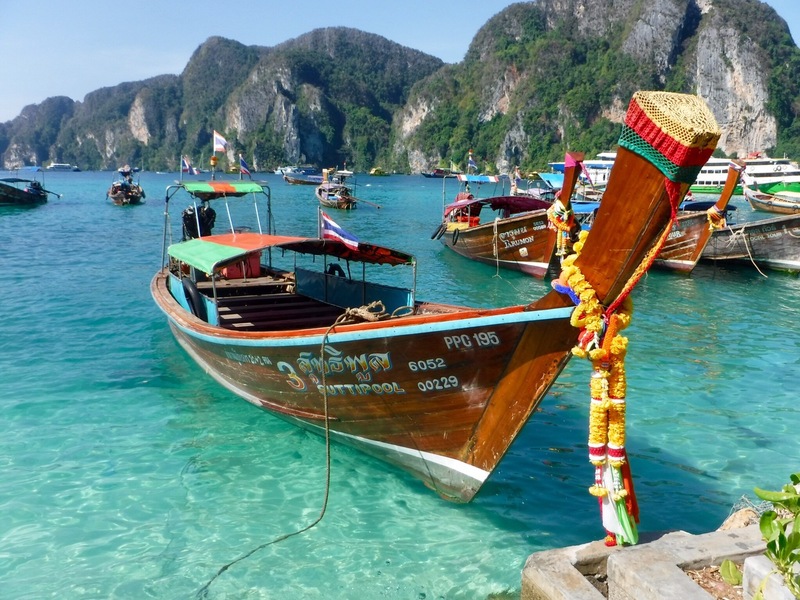 After some beans on toast for breakfast (this has become a luxury now), we headed to the pier ready to board our boat to Phuket. And guess who was there? Yes, our favourite Spanish speaking friends were there once again to wave off one of them who was getting on our boat too. How is this possible?!?! Our boat ride was fine as we had reclining seats and watched pirates of the Caribbean on the TV screens and we arrived safely in Phuket for our last night as a trio. What a fun experience! I love the beautiful scenery– gorgeous beaches. 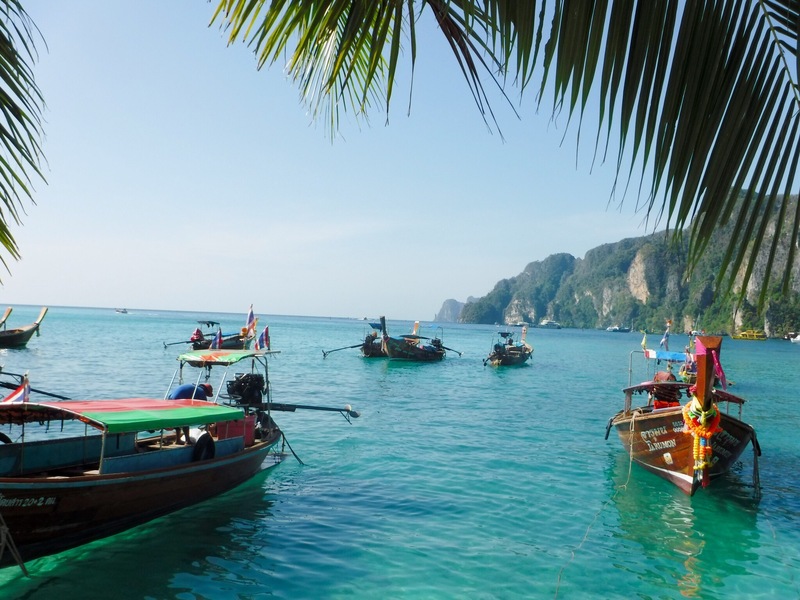 This post brings back some memories – we spent a few days for Christmas on Phi Phi. 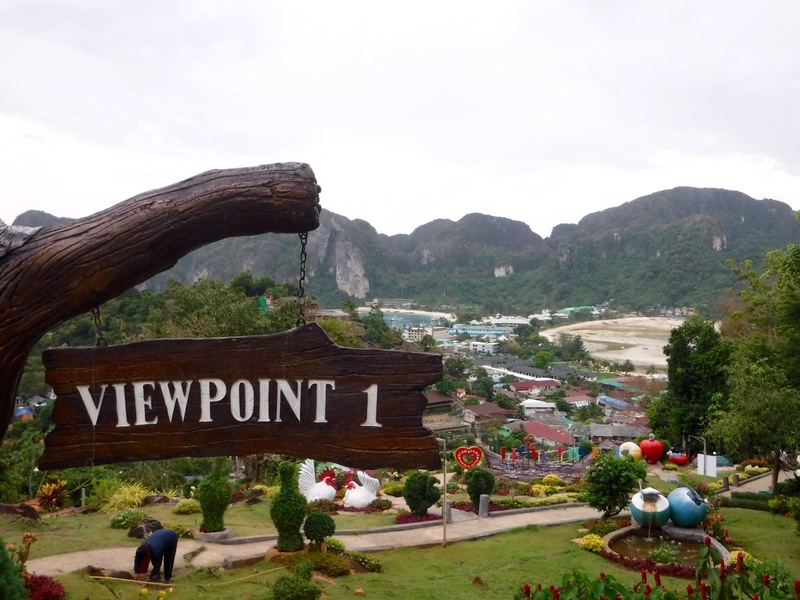 The view point is worth visiting, we also went to viewpoint 3 and then we followed the trail through the jungle until we’ve got to another view point and encountered some angry monkeys. 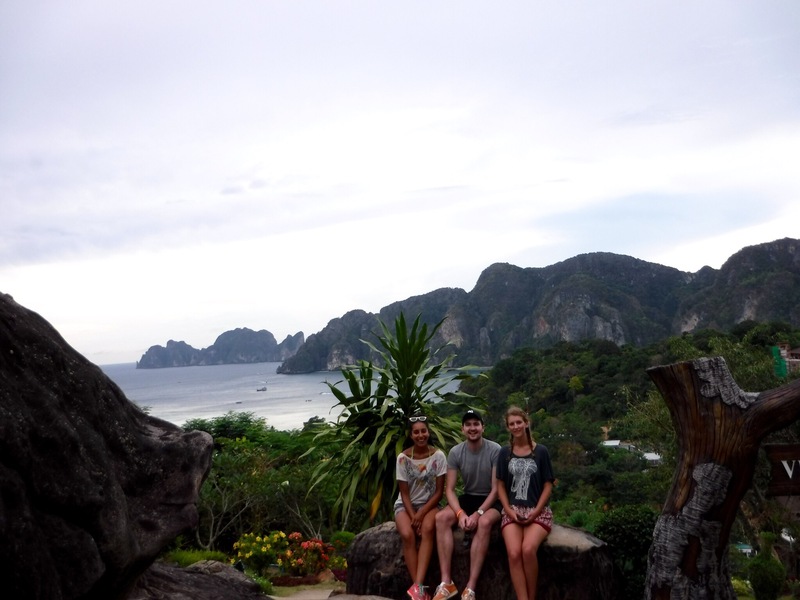 Phi Phi is amazing but I think is too touristy now and over priced. I agree! It is a beautiful island but so expensive and absolutely full of tourists. I don’t understand how even a bottle of water in 7/11 can be more than double on Phi Phi!